I had some daikon in my refrigerator and not sure what to make with it, then I remembered some delicious soup with a clear and delicate broth I ate in Japan with lotus roots and fish. I decided to go that route with my daikon. 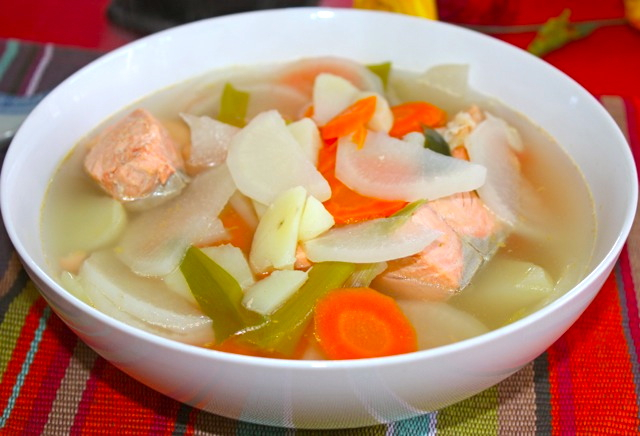 After a bit of research, I found a recipe for a similar soup made with salmon and daikon called ” Sanpeijiru“. I found this recipe on this beautiful blog called “Just One Cookbook“, and since I loved most of the recipes, I thought to try this one out. Sanpeijiru is a specialty from Hokkaido where they eat a lot salmon and potatoes. One particular thing about Japanese is that they are very particular about their broth and always filter it so that it becomes crystal clear, with absolutely no residue. My Japanese neighbor, Rui is so picky that she uses coffee filter instead of fine strainer to obtain an impeccable broth. The broth is made of Kombu a thick seaweed, which is the base of most broths, and gives a very delicate flavor. Daikon is a staple of Japanese cuisine (and many parts of Asia too), it’s a thick and white radish used in broth, grated, pickled, in salads, or on sashimi, in so many different forms or shape. It’s high in vitamin C and one root vegetable very low in calories. I did marinate the salmon with salt and sake, but not for 2 days, just one day. I used scallions instead of the Tokyo Negi and used salmon fillet instead of salmon scraps. I wanted to add some greens such as kale, but I decided to try the original recipe for the first time. Kale is not really a Japanese ingredient so I thought to keep it authentic. 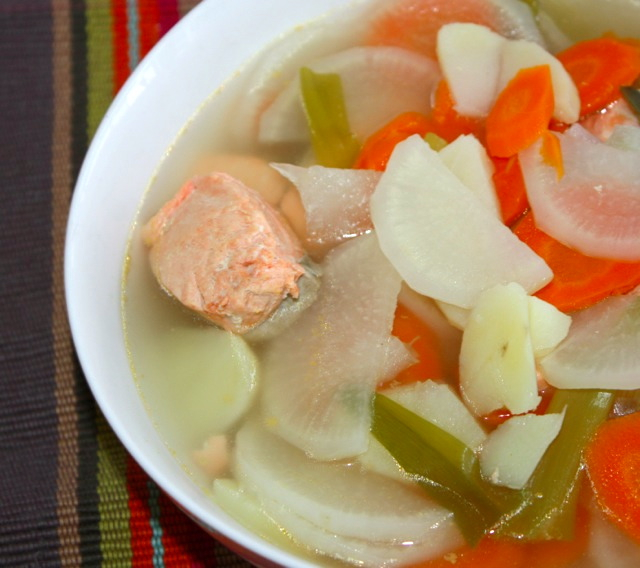 The result is a clear and clean brothy soup, very delicate, and obviously very light. I just feel clean and nourished which is a great feeling. Marinate salmon slices in sake, salt and lemon or Yuzu for 2 days. Cut salmon fillets into 4 inches pieces. Bring water to a boil, pat dry salmon fillets and blanch them for 30 seconds in boiling water. Drain and rinse salmon pieces. Bring 4 cups of water to a boil and add salmon and kombu and let it cook for about 15-20 min. Filter broth to obtain a clear fine liquid. Add vegetables to broth and let simmer until tender but not mushy. Remove kombu. Filter some more if necessary. Add sake and adjust with salt. This entry was posted by silvia on May 19, 2016 at 10:16 pm, and is filed under Fish/Seafood, Soups. Follow any responses to this post through RSS 2.0.You can leave a response or trackback from your own site. WOW!!! Thank you so much for trying my Sanpeijiru recipe! Yours look SO GOOD!!!!! I’m so happy that you enjoyed this recipe. Thank you for linking back to my post.